This small plug-in display case is an eye catching, compact solution to display merchandise in places with limited floor space. It is a welcome find when hunting for a quick snack. It can be placed in the most crowded shopping areas or next to the cashier stations to stimulate impulse purchases. The curved, self-service semi vertical Pluton refrigerated display case is ideal for the display of meat and dairy products, fruits and vegetables. Pluton has the advantage of making smaller rooms appear more spacious. Thanks to its thermal insulation and special air flow control system, heat exchange between the refrigerator and the environment is significantly reduced. The availability of the block layout helps optimize floor space utilization. An autonomically operated Pluton Flower is created for the exposition and sale of cut flowers. Cut flowers are one of the most short-lived products and must be kept in coolness to remain fresh longer. Pluton Flower provides stable optimal temperature range +5…+8˚C to preserve them. The stylish external lighting accentuates the attraction of the flowers and perfectly illuminates them. 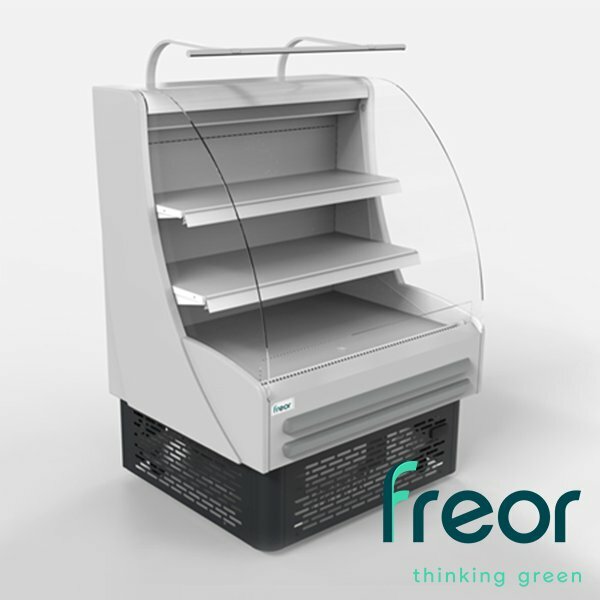 The wheels with stops give the mobility to the refrigerated display cabinet. Specially designed to store cut flowers at optimal thermal conditions, this small footprint autonomous display cabinet can be placed anywhere in the store. A temperature range of +4 to +6 °C ensures the longer lasting freshness of cut flowers. Its outside lighting enhances the natural colours of flowers to attract customers and helps to prompt impulse buying.